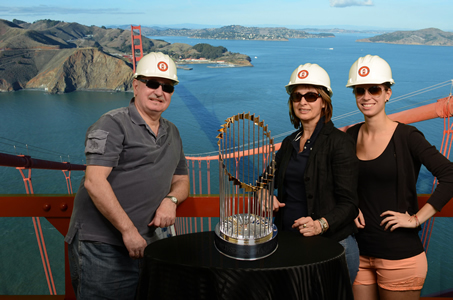 Get your photo “on top” of the Golden Gate Bridge with the SF Giants Championship Trophy this Sunday! This Sunday, June 9, from 9:45 am to 1:15 pm, the San Francisco Giants 2012 World Championship Trophy will be at the Golden Gate Bridge and Giants fans can get their photo taken with the Trophy “on top” of the Bridge! Special “green screen” technology will allow you to pose on top of the South Tower of the Bridge with the Trophy (see attached). Cost is $20 for a professional 5″x7″ photo in a commemorative folder (or 2 for $30). Photos are first-come, first-serve and are not guaranteed. Come early! Location is at the Golden Gate Bridge Round House at the southeast end of the Bridge. Due to limited parking options, it is highly recommended that you walk, bike, or take public transportation to the event. Plan your transit trip on Golden Gate Transit at www.goldengate.org or call 511 (say “Golden Gate Transit”). Visit www.511.org for other Bay Area transit agency schedules. Please note: this is a Trophy photo event and not a Trophy “viewing” event. All Trophy photos will be taken by an authorized photographer and no personal photography of the Trophy is allowed.